One of our most favorite destinations, the 7 Rila Lakes, is without a doubt also one of the most beautiful places to visit in Bulgaria. Spending several days in the Sapareva Banya and dedicating one of those days to the lakes is an amazing idea, but did you know you can also add them to your list of day trips while in Sofia? According to Google Maps, the journey from Sofia to the beginning of the lift (which is also the start of the hiking path if you choose to walk) is approximately 1h and 30 minutes. Check this link for more info. Don’t forget to check out the list of awesome cars we’re described in details for you (rented from our very good friends at Val &Kar). If you’re not driving, check this link for shuttle services from Sofia to the 7 Rila Lakes. 1. What to wear when going to the 7 Rila Lakes? I prefer long ones as they protect my legs from scratches, but it’s up to you. Decathlon (which happens to be one of our favorite stores) offers some really cool ones that can easily turn into shorts. Check them out here (and yes, they are also suitable for ladies, nevermind what the website says). Preferably waterproof as well – mountain weather is quite unpredictable and you never know what will happen. We personally prefer the hunting section in Decathlon to the hiking one, but both have some really cool things. Do not think you won’t need it just because it’s summer. Go for a jacket with a hoodie, preferably a wind stopper. This (link) jacket for ladies is absolutely beautiful and this here (link) is also an amazing idea. Here (link) is something for guys as well. Leave your purse. Seriously; I mean it – leave it. The mountain is a place for backpacks, so please be reasonable. Here’s my list of must-have items. Water bottle. Check this one here and buy something similar (plastic changes the quality of your water and we don’t recommend it). Sunscreen (if your skin is sensitive). Check the weather forecast on this link before you go. Even though it’s in Bulgarian, you’ll understand the most important things. The 2 pictures you will see there are changed every 30 seconds, so you can also see the what it looks like at this very moment. Lift’s working hours: 9 a.m. till 4:30 p.m. This basically means that the lift stops at 4:30 p.m. so if you’re planning on using it on your way back, you want to make sure you’re there 4 p.m. the latest! For the summer season of 2017 the lift will operate every day from 9 in the morning until 4:30 in the afternoon. On Monday the lift doesn’t start until 12:00 lunch time (weekly check-up time to ensure everything is good with it). The phone number of the lift is 0884 163 479. 6. How long does it take to see all 7 Rila Lakes? The lift from Panichishte takes you up in the mountain where you can begin your trip to the 7 Rila Lakes. The first thing you will see is the chalet where you can have a cup of coffee or tea or use the loo. When you’re ready you can begin your walk. There are two ways to see all the lakes. The beginning of path one is located to the right of the entrance of the chalet and begins with a serious incline. The other path begins behind the chalet. Although many choose the first one, I personally preffer path #2 (behind the chalet) – I personally find it more beautiful. The path takes you around 5 of the lakes. If you want to see all 7 of them, you will have to make 2 detours. The first 5 lakes will take you about 3 hours (depending on your speed) and if you decide to see all 7 you will need about 5. Of course I strongly recommend you spend as much time as you can there and enjoy every moment – the screnery is absolutely incredible! Info: We do not make any commission from the links in this article and are not paid by neither of the companies presented here. We have recommended the items we use and the companies we trust. Over time I’ve come to realise that many people are confused by the route on the 7 Rila lakes, so here it is, explained. The dashed line marked as #1 is the general route that starts from the Rila Lakes chalet – precisely where the lift ends & begins. This path allows you to see 5 of the lakes. If you’d like to see all 7 you’ll need to continue on the path #2. It starts with an ascent right after the Kidney Lake. There’s no way to miss it – the path is obvious and there’s are usually people on it. do you know if the trails are open for hiking? We plan to arrive with a 2 years old baby, do you know if it’s possible to do it with her? Is there a viewpoint over all the lakes with a bit of walking? What a wonderful post, and just what I need to get more information on the hike around the 7 Rila lakes. Quick question – would you classify the hike as easy or medium? And would you require walking sticks? Hi! Over time I’ve come to realize that it depends a lot on people’s fitness level. To us it’s a really mild hike, but I’ve seen people give up half way through. So, let’s say it’s not the easiest hike, but not very challenging either. Walking sticks are always a good idea in the mountains (especially in Rila). 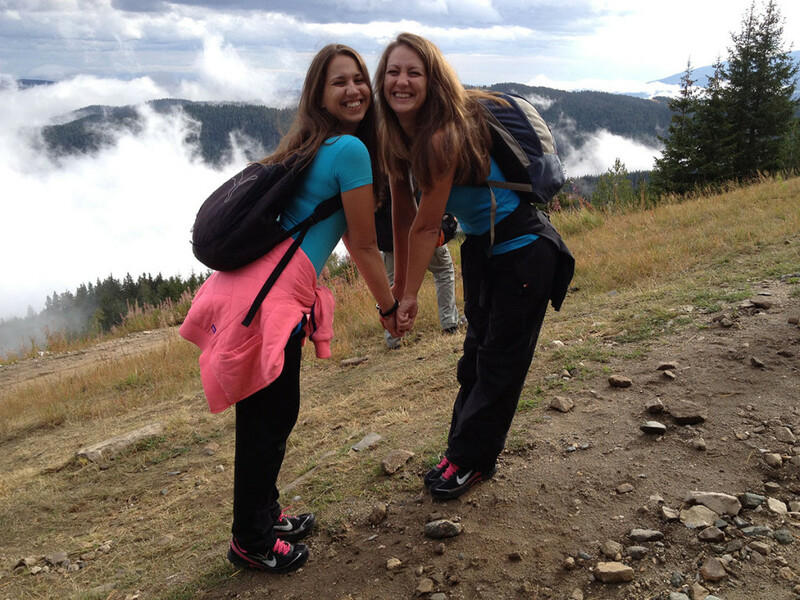 Wishing you a lovely hike and great weather! We are plan to visit Malyovitsa hut after visiting Ivan Vazov and from Malyovitsa hut we plan to go down to the area of Central Mountain School “Malyovitsa” ski area. From Malyovitsa we are planning to go east on the red mark and then north on the blue to the green and to the ski resort. My quetion is – How beutiful is the route from the ski area to Pionerska hut going through Vada hut? Is it worth to hike this or it kind of a waste of time and it will be better to find a car that will take us from the ski area to Pionerska hut? (It is a long hike – 17km~ if we will do all the way by foot). Hi Roy! I just looked at the route you’ve planned and quite frankly – I would not do that in a day. If I were you, I’d stay overnight in Malyovitsa and continue to Pionerska on the next day. Rila is a beautiful mountain, but it is tiring and 17km on it would have been easy if it wasn’t for the constant altitude change. Hope it helps. I’d love it if you’d drop us a line and tell us how it was when you get back. Hi! I am planning to do this hike in August with my dogs. I was wondering if it’s possible to walk to the lakes instead of taking the lift, and if so… is it too hard? Thank you 🙂 This post is super helpful! Hi Patricia! Thank you so much for your kind words. You can absolutely take your dogs with you. If you avoid the lift the hike up to the chalet is about an hour long. It’s steep, but certainly not a problem (we purposely avoid the lift every time). The only thing you have to make sure is that you’re at the beginning of the walking path early enough so you have the chance to see all the lakes. The beginning of the path is located about a 50m right from the booth where you purchase the lift tickets, and begins behind a wooden cafe-bar. Enjoy! Your blog is so helpful and I am very excited for my hike tomorrow! 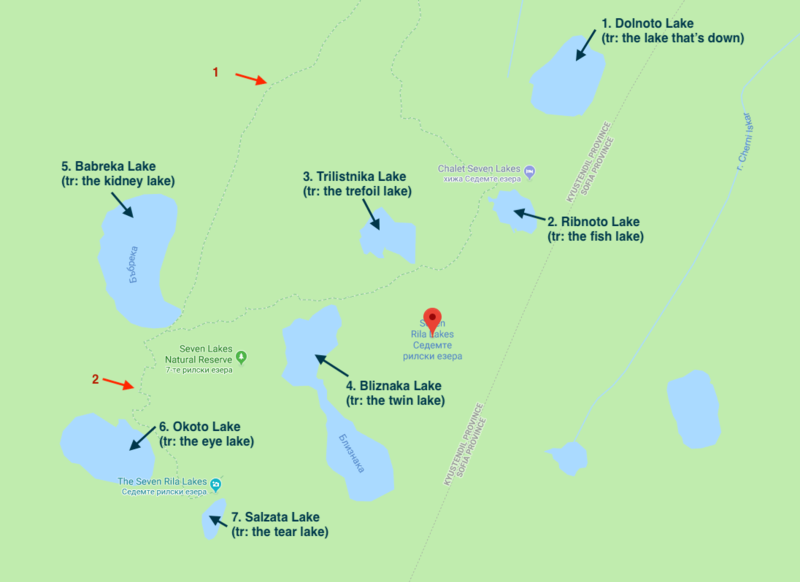 It is last minute but I want to do all 7 lakes and have not been able to find a map that shows how to get to them and still return to the Panichishte lift. If the 5 lakes is a circular path where does one turn to go see lakes 6 & 7? Are there signs? Hi Wendy! I’ve just added a 7th section in the article which shows the path and explains how to get to all 7 of the lakes. Hope it helps – have an amazing time! We are coming in August – can’t wait! When you wrote 5 hours is that both ways? about how long is the walk going up? When it comes to reaching the 7 Rila Lakes Lift from Sofia or Plovdiv – your best option is to look up shuttle services. If you are determined to use the public transport, you’ll need to change several buses and a taxi. I wouldn’t suggest you do that as it would eat up your time and honestly if I was to do it, even though I’m local and Bulgarian is my mother tongue I would be seriously challenged. Unfortunately, our public transport system doesn’t offer any direct bus services from any of the big cities in Bulgaria to the beginning of the lift station below the lakes. Regarding the duration of your holiday – The Rila Lakes are perfect for a day trip. So I believe 3 days will be more than enough for you to enjoy the area around the 7 Rila Lakes. I’ll be in Bulgaria in Spring this year and of course I’d like to grasp a bit of the wonderful views in the Rila Mountains. We will precisely be there on April 28. Even if there’s snow it would be nice to have the possibility to go up the lift to the Seven Lakes. But unfortunately the page (rilskiezera.bg) is only in Bulgarian… Do you know if the lift is open at that date? Thanks!!! The lift works all year around, unless the weather conditions are too bad and doesn’t allow it. I´ll be the the 28th of April too. Do you know if it possible hikking and see the lakes in this day or the weather will be so bad? I´ll be there the 28th of April too. Do you know if it is possible to hike the mountain and see the lake in this time or the weather for these days will be so bad? I cannot see the cameras of the lakes right know, I do not why. I´ll be there the 28th of April, Do you know if we can hike and see the lakes? or the weather will be so bad. hi, would you recommend the lakes in december? Hi Ana! I am sorry for the delayed reply. Unfortunately (for what I know) the lakes are frozen in December and you can’t see them. Besides, the walk there requires a really great equipment, so unless your fully prepared I don’t think it’s a great idea. On the other side – if you catch a good weather you may end up seeing amazing views 🙂 So – if your gear is good – go. If not, wait until early June for the crocuses! Hi Nina, I am trying to get a trip for tomorrow 18/09 and it is becoming quite dificult. DO you know if it is possible? I would like to join some already organised trip since I dont want to pay 100 euros by myself. I tried calling the number you write up here but they couldnt speak English. 1. How it is possible to get to the Pionerska Hut Lift from Sapareva Banya center? 2. Do we need to book the lift tickets in advance ? (to avoid a lifr queue). 3. Do we need a guide for the tour? Hi Nina! I read on another site that the lift up to the lakes doesn’t open on Mondays until around 12 noon…is this true? We will be there at the end of July and are trying to decide if Monday morning is a viable option for a 9am start! Thanks for your help. Hello Nina, Thank you for the very helpful information! I’ll be in Sofia next week and would like to visit the 7 Rila lakes. I’ve found the opening times for the lift from June-September but no details for other months. Do you know if it’s possible to use the lift before June? And I’ll be driving so just wondering if it’s possible to park the car close to the lift? Thank you! Hi Gabo, thanks for stopping by and for your nice words. I’ve used the lift in may and there was no problem with it. However it’s still cold up in the mountains and we generally don’t recommend hiking before June. Nonetheless I don’t know what the situation is now so I’ll call them tomorrow and will drop you an email. Great post on the lakes! We will be traveling to Sofia soon and hope to visit the lakes on 12th of July. We have a four year old kid. You think we can see a few of the lakes with the kid? How difficult a hike is it? How long would we need to walk from the chalet to see the first 2-3 lakes? Thank you for stopping by and for your compliments. Going to the 7 Rila Lakes with kids (or a kid) is absolutely possible! My advise would be to take the lift so you do not get the kid tired. Once you reach the chalet, head to the Kidney (Babreka) lake. The path starts from the entrance of the chalet going directly up, but it’s not a hard walk. After the initial hill (which should take you up to 30 minutes slow walk) you’ll reach a plateau and from there and on it’s just like a walk in the park. Somewhere between the chalet and the Kidney lake there’s a view point which offers a great view over several of the lakes. Once you reach the Kidney lake you can then decide if you’ll go further or simply return. I have seen plenty of people with kids (even babies) who take walks over there and it’s overall a great family place as you can let the kid run around without worrying too much. Hope this helps! Enjoy your walk! Hi Jaskaran! Thank you so much for stopping by and for your comment – I am so glad I was able to help! If you’re still in the area, you may want to have a look at the Stob Pyramids. It’s a much easier walk than the one on the Rila Lakes. Additionally, since you’re with a kid you may want to have a look at this swimming pool. Hope you’re enjoying your stay in Bulgaria! Hi Naina! There are two easy ways: either rent a car or use Rila Shuttle. 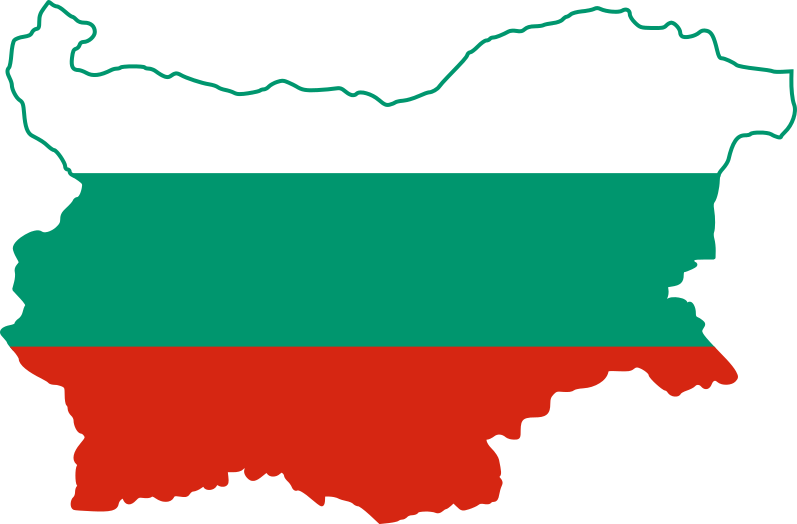 Hey Nina, I will be visiting Bulgaria in the last week of May. Would that be a good time for hiking in Rila to the monastery and the seven lakes? Any idea how cold will it be? Hi Aarav! We don’t usually recommend going there before June but I’ll call the chalet tomorrow to ask what the situation is and will drop you a line. Hi Aarav! I tried to email you but there was an error. I called the chalet yesterday and they said there’s no snow anymore (for season summer 2017). Enjoy your hike! We’re planning a trip to the 7 lakes. Where we have to take the lift: in Panichishte or in Pionerska? Hi Boel! You need to take the lift from Panichishte. The exact location of the starting point is about here. About the walk to the 5 lakes. You’re not going to need a map – it’s a circular route but most of the time you will be seeing the chalet, so just keep an eye on it. The path is marked as well so there’s nothing to worry about. If you’re a photography fan when you reach the kidney lake you’ll see a path which goes up. If you follow it you will reach a view point from where you can see 6 out of the 7 Rila lakes (if I’m not mistaken). Enjoy! Thanks for all the info very helpful. Do you know what it will be like to climb the end of May? I am aware this is just before summer season. Hi Ria! Actually I just spoke with the people from the chalet there and they confirmed that around the chalet there’s no snow anymore. They said there is still snow up towards the lakes but I’m sure that it will be great to go there at the end of May 🙂 Let is know how you like it. You can always send us a message on Facebook (https://www.facebook.com/FollowTheSisters) or email us from the Contacts page here! hi, im planning on going there with my father, but he cant really walk… is it worth going there just to sightsee from the car? hi, Im traveling with my father and it is very hard for him to walk. is it possible to tour the rila mountains with car? I am thinking of going there at the end of December. Does anyone know what it is going to be like? Will it still be beautiful in snow? Thanks. Nice post and very cute photos :))) One tip from me – avoid the weekends. It is too crowded. Thank you Adi! That one is indeed a valuable one!